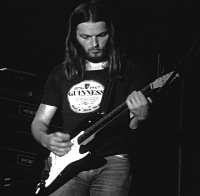 David Gilmour of Pink Floyd in the 1970s. Some songs get taken for granted. We listen to them over and over again, feeling a vague sense of sentimentality and yet never really understanding their brilliance until we are ripe enough in our experience to finally hear them with a more evolved set of ears. I had an experience this week with my group clients that involved music. It so neatly smoothed over the rough edges of a lesson I had been attempting to teach in my ambition for sageness—a lesson that I was myself recently learning. It is one of the most fascinating aspects of being a therapist, I have found—this congruence of lessons that passes from therapist to client. What an illusion it is to believe that we are separate from our clients. I have realized an uncanny tendency to be “in the lesson,” and that often times, what I am learning is so relevant to what could be useful to my clients. It seems to be an aspect of existence that reinforces my belief in paradox over irony. So, I run a group on interpersonal relationships and I recently have been speaking with my clients about fantasy as a defense. I have clients who hold on tightly to their dreams of perfect love, only to find themselves deeply disappointed that their lovers don’t deliver “the goods.” In fact, some of their lovers are downright nasty and dismissive. These clients, from an outside perspective, get taken for granted in relationships and don’t want to admit it. In exploring this harsh reality, we have discussed the function of fantasy. It is so much easier to believe in possibilities than to be with what is in the moment—being vulnerable, fallible and open to a future that contains vicissitude and adversity. On the contrary, some clients get stuck in their fears. They don’t quite recognize the gifts of their realities, and their minds take them into a past template of misery that quickly projects itself into the future. Many of them have told me of the many relationships that ended due to isolation and withdrawal, or bitter attacks at imagined offenses and inevitable human mistakes. Fantasy isn’t always glass slippers and golden rings. Sometimes, it is the very gates of hell that we dream into. And of course, the two seem so polar to each other. During last week’s meal group, we were all listening to Pandora as usual. One of my clients looked at me and said, “You know, Candice, I have been thinking every day about your comments about fantasy as a narcissistic defense. I notice it all the time now.” I was so surprised by this, and of course I was delighted. We therapists LOVE it when our clients remember something we say and actually apply it to daily living, even if just perceptually. Although I don’t remember the exact train of thought that followed my clients’ comment, I do recall that we had progressed to a conversation that involved polarity versus paradox. This is yet another perspective that I often explore with my clients. We discuss how polarity only feels like polarity because we are destined by the very quality of ego and self to stand at one vantage point within a whole. The horizon is the horizon because of where we stand, but if we stood at the horizon, it would be the ground beneath our feet. We apply this concept to relationships and “the sides we take.” We also apply this concept to a belief I have that all people contain a capacity for everything, including the good and the bad. Our glorification or demonization is the true distortion. As this discussion was progressing, Pink Floyd’s “Wish You Were Here” came on the radio, and of course, all of us paused in awe. It is one of those melancholic songs that somehow captures all the tenderness of true longing in the midst of an absurd world. The lazy melodic reach upward and resting return ponders, but never works too hard technically. The rhythm is tired. The entire song sees too clearly, and wants to take a rest. There is a very honest feel to this tune. As I listened to the words of this song, I heard a new meaning for the first time. I heard the poetry beyond the language. I felt my consciousness shift, and the teachable moment inserted itself into what I was so less effectively trying to teach, all through this song that came into existence when I was just four years old. The first aspect of meaning reminded me so much of the birth of my daughter, Emily. When I gave birth to Emily, I had no anesthetics. I went for natural childbirth—successfully. It was no walk in the park. Despite having what the midwife called “a textbook perfect first birth,” there was great suffering. In addition to exiting my “default consciousness” and entering an altered state, (which, mind you, I feel is just as credible as the default state), I felt the most excruciating pain imaginable when I gave birth to my daughter while simultaneously feeling the most extreme bliss imaginable. I was in hell and I was in heaven. I literally thought this. “Heaven and hell are not separate places. They don’t even co-exist.” They are the same place, and we just divide them into parts because it helps us organize our world into something manageable, and perhaps, even more tolerable. It’s much easier to believe that there is an end to the means, and that if we are “good,” that end will be blissful. Still, somehow I knew that the lesson in birth—that radical, awe-full place I briefly visited in that hospital room—was quite possibly as close to raw truth as I would ever get. Amazingly enough, I had an opportunity to help a client die in hospice when I was an intern, and the experience was remarkably similar to a birth. The man who was dying was in terrible pain, and there was so much beauty present in the process. I often wonder about polarity. Is there such a thing? Is polarity just a result of our inventions and limitations of perception? Do we see polarity in other people and life in general because we can barely tolerate the reality of inevitable pain? What I have always loved about existentialism is that it does not ignore the dark side of existence. How could one candy coat life when senseless brutality of innocent people occurs on a daily basis? I can’t attribute that somehow to karma. I believe it is just a condition of life. Irony is a step in the right direction regarding understanding. The great literary figures make good use of it. Irony speaks to the incongruent conditions of our expectations and outcomes. But paradox—paradox takes irony a step further into an understanding of posited truth. Paradox stretches us. Paradox also condenses us, gathering our fragments of experience and melding them together into an entirety of integration and meaning. Paradox is not about incongruence. Paradox is not even about co-existence. Paradox somehow lets us know that what we believe is opposite, is not. It is the same, but with different qualities. Diamonds cast a beautiful light, and can also cut glass. Cats can scratch, and can also cuddle. The sun can shine, and can also burn. Lemons smell sweet, but taste sour. These things hold the good, the bad, and the ugly. What happens when we realize that everything we thought was evil and painful has the capacity for a beauty beyond our recognition? What if we were able to see that what we worship—what provides us with our greatest pleasures—also has the capacity to cause us deep pain? This in no way matches the Manichean philosophy of good and evil. Everything is everything. We all are cursed and we all are blessed. The realization is so potentially shattering; our brains can hardly stand it. Our hearts can hardly stand it. When we let go of the fantasies and fears, we see that everything and everyone standing before us has the potential to harm and hurt us, and this is tragedy. We tolerate by virtue of our choice to love anyway, rather than throw away those we love because occasionally the majesties of life force us to see beyond the splits we create to protect our illusions. We comfort each other. We look to each other when we come too close to this very hot flame, and we forge on. Just like some songs, we take some people for granted. We don’t really hear or see them for their entirety, and often it is because we don’t want to. When we do see a new aspect of another, and the veil is temporarily lifted, we are often shell-shocked. Still, I somehow believe that this is one of love’s lessons. It is through our relationships that we come close to the entirety, and our illusions are slowly melted away, before we die and disintegrate into the abyss. Until then, we can’t really tell. But we try, and if we are wise, we love anyway. Gilmour, D., & Waters, R. (1975). Wish You Were Here [Recorded by Pink Floyd]. On Wish you were here [Medium of recording:Vinyl]. London: Abbey Road Studios.